1. 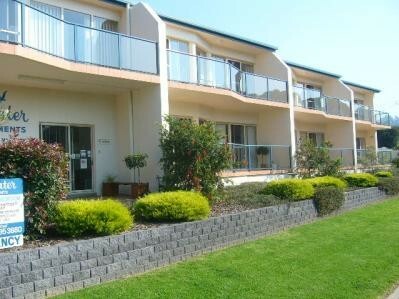 Position of Apartments in Merimbula. Town side of Merimbula. 650m to Information Centre of which 400m is along Merimbula Lake. 2. How far Spencer Park on Merimbula Lake? 3. Do you have a pool? 4. Are Apartments fully self contained? Modern Apartments built 2004 with Dishwasher, separate laundry with dryer. Apartments are fully self contained. 5. Do you have Apartments on ground floor. Two Apartments on ground floor. Not one step from car park to your lounge or bedroom. 6. Do the upstairs Apartments have any stairs within? No steps or stairs within apartment. There is 16 steps to get to top floor. Eight then a landing and another eight to Apartment. 7. Do you have a view? Apartments overlook the Merimbula Back Lake/Lagoon and the Munn Street Walk Bridge plus bushland. The Lake looks like a large river from the Apartments. 8. How far to fish and for what type of fish? At the Munn Street Walk Bridge there is suitable fishing locations where the water is 1 to 3 metres deep. Extremely peaceful location and bream is the popular fish. We have caught flathead and eel's. The lake has been stocked with prawns by the NSW fisheries. 9. The Munn Street Walk Bridge goes where? They are currently building a walk from Tura Beach Car Park to the Bridge. They have completed the section from Tura Beach to the nearest portion of the Back Lake. 10. How old are Apartments.